Richard Strauss knew a thing or two about theory and practice. His Capriccio is a meta-opera: an opera about opera. Sound academic? It is. The work takes some getting used to, but the current Lyric production is to die for. It stars Renée Fleming, offers gorgeous singing, and presents sets featuring the Queen of Divas (shuffle over, Beyoncé). Capriccio is a sort of witty, happy, operatic Sophie’s Choice. Courted by two lovers, the Countess Madeleine (Fleming) faces a difficult decision: who will she favor, the poet Olivier (Audun Iversen) or the composer Flamand (William Burden)? Of course, the whole shtick is an elaborate allegory for the importance of words versus music in opera. Duh. The answer, too, seems straightforward enough. If she picks the poet, words are more important. If she picks the composer, music is more important. Thing is, we never really find out—Richard Strauss pioneered maddening endings before Christopher Nolan ever made Inception. The grand mystery is never resolved. Director Peter McClintock’s revival production looks nothing short of spectacular. It melds Rococo with Art Deco, creating a refined and seamless aesthetic. At first glance, Madeleine’s drawing room screams Louis XIV–style excess, complete with florid scrollwork and a mural of the muses. But look closer and the set loses its historical homogeneity: a wide, sloping lampshade, smooth crystal tumblers, the swirly couch. Yet rather than distracting from a unified timeframe, these occasional Art Deco elements dress down the scene and relax the atmosphere. If you watched the Super Bowl last year, you probably remember Renée Fleming (Countess Madeleine) singing the national anthem. Fleming is one of the greatest divas on the planet, pairing ravishing beauty with the rare operatic ability to bring characters to life, this time playing the woman at the center of this terribly academic love triangle. And her voice! It’s simply a force of nature, sweeter than a 4.0 and richer than the Hamptons. 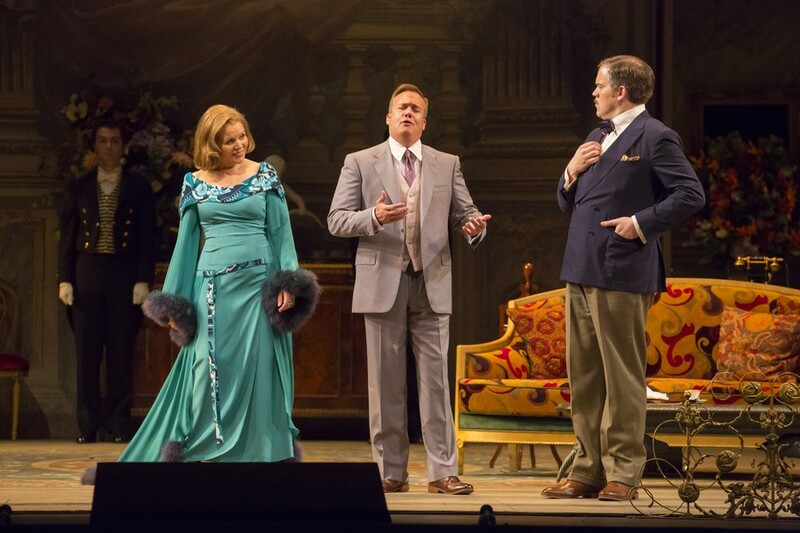 Onstage, Fleming plays the Countess with consummate dignity. Decorum gives way to passion in the immortal final scene as the Countess questions her indecision. Her melody soars over turbulent orchestration. Spellbinding. I consider the second most important character to be La Roche (Peter Rose), the lovable theater director. He’s a colossal busybody replete with unsolicited advice, playing the basso buffo, or comic bass. Yet La Roche departs from his trope in a stirring monologue two-thirds through the opera. In it, he defends the sanctity of the theater and exalts its creation of a higher reality. Rose delivers a paramount performance, singing despite a throat infection on opening night. I felt that, if anything, his condition enhanced the role rather than diminished it. A theater director knows best that “the show must go on”—Rose had the courage to do what La Roche would do. Tenor Burden and baritone Iversen play the composer and the poet, respectively. Both have good chemistry with Fleming and exude a sense of friendly rivalry. I particularly enjoyed their quick ripostes in favor of music or poetry, delivered with freshness and wit. Personally, I felt that Burden was the more convincing paramour with a defined romantic vibe. To be honest, Iversen has the disadvantage because his character’s a bit of a prude. A duo equally as dynamic, Bo Skovhus and Anne Sofie von Otter paired off as the Count (Madeleine’s brother) and the actress Clairon. Their courtship is a sort of subplot that runs throughout the entire opera with many a sly glance and flirtatious wink exchanged behind more academic dialogue. I loved the big acting scene, in which the Count recites an excerpt of Olivier’s play to show off his “considerable” acting chops by egregiously overacting to each line. Skovhus plays the buffoon to von Otter’s cool thespian. As usual, Sir Andrew Davis delivers the goods in the orchestra pit. The Lyric Opera Orchestra sounded beautifully lush, serving juicy strings with generously gilded brass overtones. I particularly loved how fluid and conversant the opening string sextet was—each part played in independent unity, capturing the opera’s salon atmosphere. Some difficulty, however, seemed to persist in balancing the vocalist to orchestra output ratio. At times the singing was muffled by overzealous accompaniment, an effect particularly detrimental to the opera’s chattier, argumentative scenes. Fortunately, Madeleine’s big moment suffered no such setback: the orchestra did not—or could not—cover Renée Fleming. By no stretch of the imagination is Capriccio an accessible opera. It’s a Media Aesthetics class put into cocktail gowns and set to music—not everyone’s cup of tea. But I loved this current production for its stellar singing and intergalactic cast. To me, music reigns supreme.